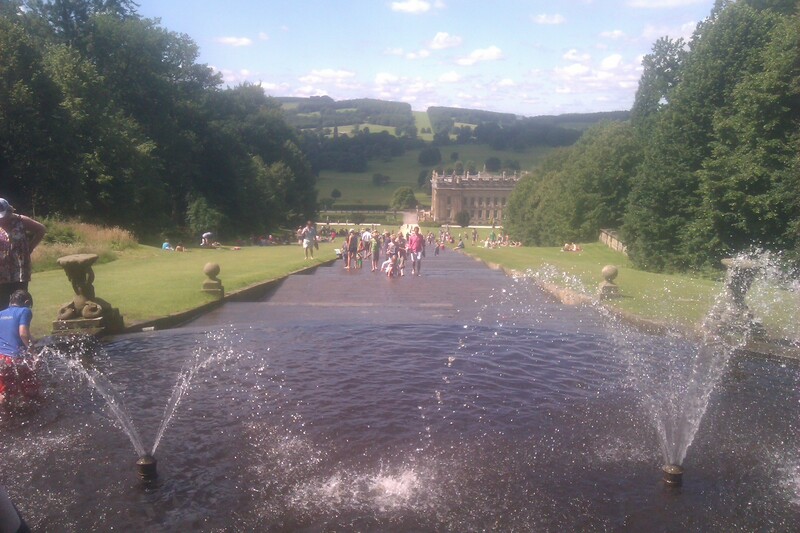 Last week I visited Chatsworth, a well-known stately home in Derbyshire. Unfortunately I wasn’t an invited guest (despite having once been present at the Duke of Devonshire’s birthday party, but that’s another story) so I had to pay to get in. There was no indication of the price on the information leaflets, nor on the various notices we passed as we queued. That should have been a clue. Once you were at the entrance and it would be embarrassing to turn back, it was revealed that the price was £15, or £16.50 if you wanted to Gift Aid it. (I’ve never heard of Gift Aid making anything more expensive before.) That made £30 for Burri and me. Bear in mind, this was not London, this was the north of England. The entry price also didn’t include anything like a guide book. No, that was £5 extra. You could save money by viewing just the gardens, not the house. That would be £11, please. There were wee buggies to help the elderly and disabled around the gardens. They were extra, too. A stately house would be wasted on children, so they could go to the farmyard and adventure playground – £5. Of course, you can’t leave small children unsupervised so a responsible adult could enter to watch – another £5. It’s not that Chatsworth isn’t worth seeing. The paintings, statues and other works of art are stunning, especially the painted ceilings. The gardens are magnificent, especially the staircase fountain that stretches the whole length of a hill and which you can walk up and down in your bare feet on a hot day – and this was a scorcher. My problem was with the way the air of money-grabbing seemed to permeate your whole visit, leaving a bad taste in your mouth and to some extent spoiling your pleasure. By contrast, when I left the north of England to return to my well-watered homeland, I was able to spend a pleasant fifteen minutes, not waiting on a dingy platform or drinking an overpriced coffee (not that I’m knocking all overpriced coffee – I do love my Costa), but playing a bit of table tennis. Sturdy, weatherproof tables had been set up outside Sheffield station. The bats were scruffy, some of the balls were dented and the tables may well disappear after the Olympics, but it was an unexpected treat. And it was free. We were perfectly prepared to pay for the table, indeed we expected to, but there was no need. The effect on people was noticable. Strangers smiled at each other, and tossed back stray balls. British people laughed and even exerted themselves in public. It was an uplifting episode. Chatsworth no doubt could not afford to support itself if visits were free, but if they care at all about leaving visitors with a positive impression of the place, they should probably try being a little less mercenary. And maybe introduce free ping pong tables.